To make the dough. Measure all of the ingredients into a bowl. 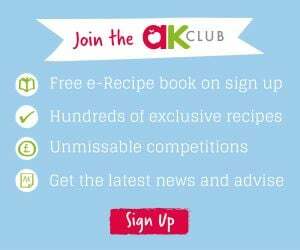 Mix together, then using your hands, knead on a work surface for 10 minutes using extra flour. Place in an oiled bowl. Cover and leave for 2 hours. Preheat the oven to 180C Fan. Roll out the dough using a rolling pin to a 40 x 20 cm rectangle. Spread over the pesto, sprinkle with the cheeses, basil and chopped olives. Roll up from the long side and cut into 12 slices. Arrange in a circle on a piece of baking paper on a baking sheet. Cover and leave to prove for 30 minutes until puffy. Brush with egg wash.
Bake for 25 to 30 minutes until well risen and golden brown. Decorate with cherry tomatoes, basil and mini mozzarella balls to create your Christmas wreath. 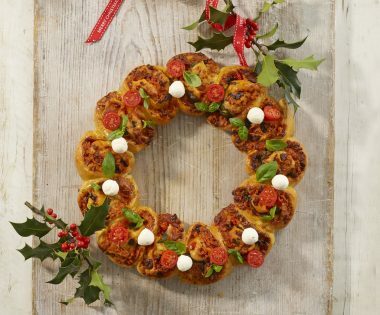 Annabel’s Christmas Pizza Wreath is a true crowd pleaser at any party.